My hands are now better so I finished the second jaywalker. 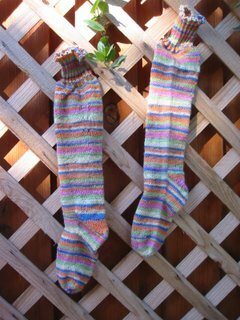 This is such a wonderful pattern; easy to knit, the construction I like for socks, and a good fit. I really think that the chevron effect with the self-striping yarn works well. The yarn is Socks that Rock in Moss Agate and I also really like the wool, it's soft to work with. My photographer was Adam who recieved a camera for his birthday and is thrilled to photograph my feet for me. I'm standing on an old sea chest I got for my 21st birthday from my then boyfriend. It's covered with a quilt made by Christina a couple of years ago. I also want to link to another blog, this time of my friend Louise who has recently moved to Senegal. I have known Louise since high school, which is now a horrifying 28 years! Her blog is already full of interesting details about living in West Africa so I'm looking forward to reading more, and to seeing some photographs. I can now show some of the secret Christmas knitting. This is a sweater I knitted for Gill. 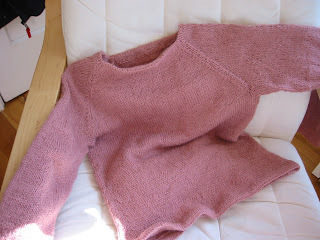 The pattern is the Hourglass Sweater from Last Minute Knitted Gifts and it's knitted in Elann 100% alpaca. It was really nice to knit and the fabric is very soft. Also for Gill are these cashmere socks. 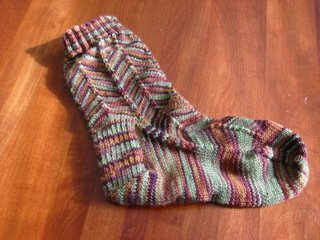 The yarn is from PoshYarns, the pattern my generic sock pattern. 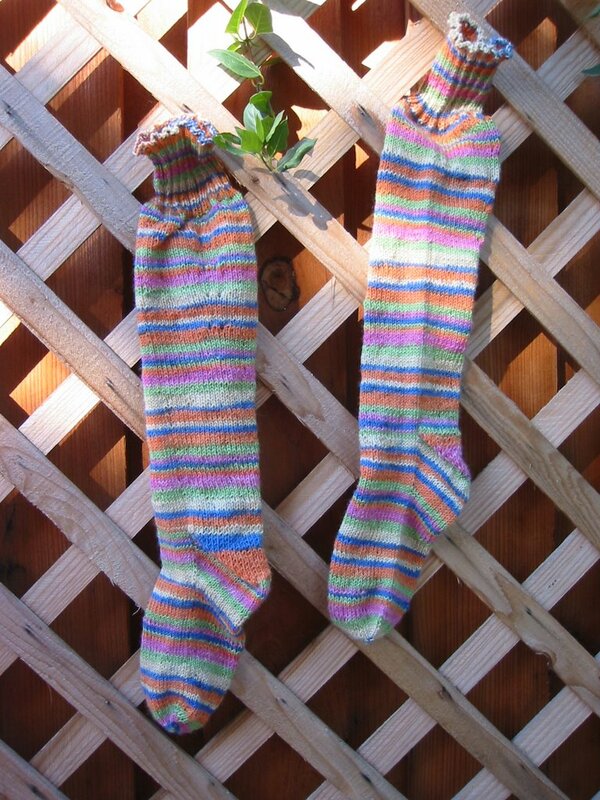 There were also socks for Mammie and a cardigan for Christina. However, i seem not to have taken photos of these. of a sunny Christmas. Here in LG it is sunny at the moment, with rain forecast for later in the week. 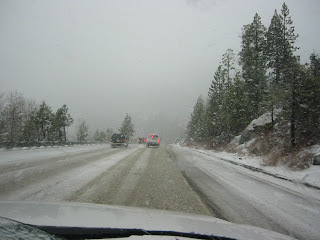 So it was a change to pass through this on our way back from Tahoe. Its as close to a white Christmas as we are going to get here. Nigel is off on a bike ride, and I need to go and collect the bird shortly... we are getting ready. Wishing you all a Happy Christmas from all of us here at Ferretworld. On Monday we headed up to the Sierras for a few days skiing at NorthStar. There was not a great deal of snow - but quite a lot of the resort was open and there was enough skiing for us for 3 days. 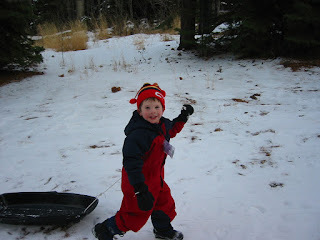 Tuesday was Adam's sixth birthday - he celebrated with a long day skiing. 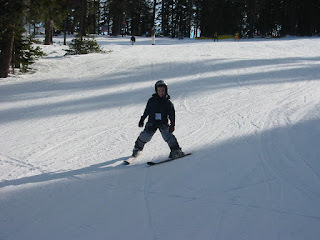 He is very confident now and we can pretty well ski all over the green and blue runs at Northstar. He skiied from the summit of mt Pluto to the village. We also had birthday presents and cake of course. Finlay was less keen on the skiing. We did get him out for a few hours each day skiing on the end of our poles. He also skiied a lot of the green and blue runs but does not share Adam's confidence. What he really wants to do is play in the snow. It's a snow-ferret - here with my own dear ferret. 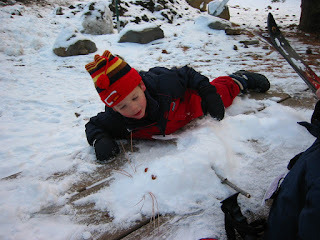 If you look closely you can see the angel and snowman chains that they boys made - heavily decorated with glitter glue. 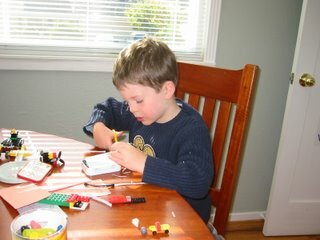 Somehow glitter glue just does not have the same appeal as those phials of glitter that we used to have - but probably a lot less messy (and the glitter glue was messy enough for me to begin with). 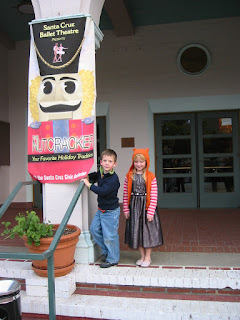 On Saturday Adam and I went with Emma to see The Nutcracker at the Santa Cruz Civic Auditorium. This was Adam's first experience of ballet which he summed up after the first 10 minutes... "but it's all just dancing". Having said that he was still and quiet for all of the 2-hour performance. It was a semi-amateur performance, with only the principals being professional. The part of Clara was danced by the daughter of a friend of Julie's so we got to go backstage and meet her afterwards. The standard of the production was high and they had a full orchestra so I really enjoyed the whole performance. Afterwards we went to Marinelli's in Santa Cruz and had hot chocolate with 'smudge' (fudge) on the side - heavenly - but so filling I could not eat dinner! 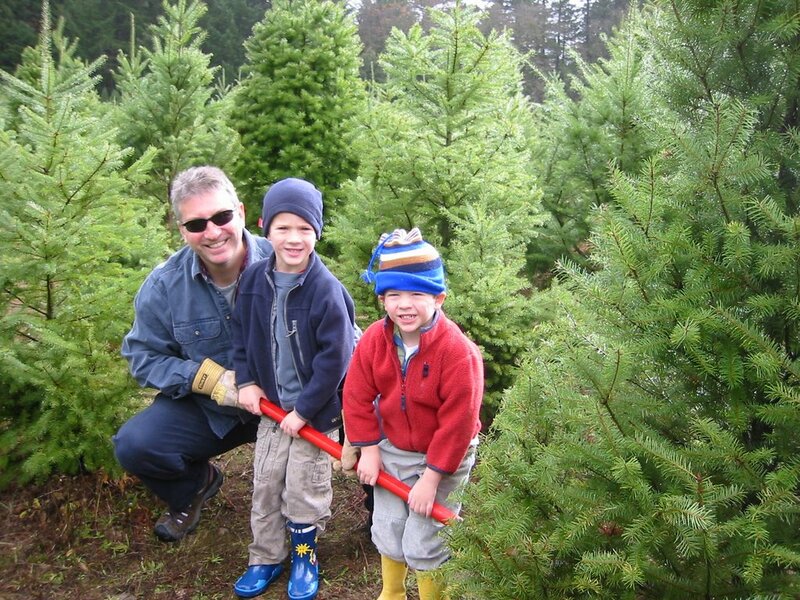 On Sunday we went to Castle Rock Tree Farm on Skyline Blvd to get our tree. 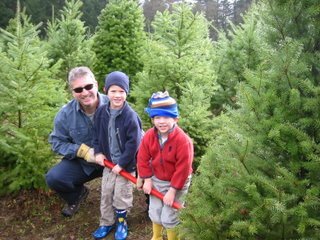 It's become a Christmas tradition to go there and the boys love it because there is mud, dogs, and sharp instruments. 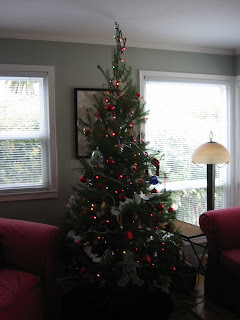 As always, we chose what we think is a small-ish tree, then can barely fit it into the living room. These are for the boys' school teachers for Christmas gifts. 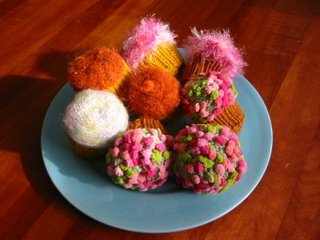 This is a different pattern than those I knitted for Jules, this pattern came from my knitting group at the library. However, this is the last of my knitting for the time being...I went to the doctor on Monday about a pain in my left hand and I am ordered not to knit for a week at least. I'm really impressed with this pattern, its so simple but it really looks good in a self-striping yarn. This is Socks That Rock. The fit of the sock is also really good - the chevron pattern is very elastic. 1. Egg Nog or Hot Chocolate? Egg Nog – but only from the hut in Ortesei with the dishy guy. 2. Does Santa wrap presents or just sit them under the tree? Wrapped of course, they appear magically on Christmas morning. This is a new tradition for us since it stops the boys opening any presents in advance - their own or mine! 3. Colored lights on tree/house or white? White on the outside - icicles on house, baubles in porch, 2 reindeer on lawn, and lights on tree (did I say classy?). On tree inisde I have moved to coloured lights. 4. Do you hang mistletoe? When I can get it. 6. What is your favorite holiday dish (excluding dessert)? Bread sauce – Im the only one who likes it but I still make a pint all for myself. 7. Favorite Holiday memory as a child: Oh so many – the best is probably the sensation of waking on Christmas morning with the heaviness of my filled stocking on my feet. 8. When and how did you learn the truth about Santa? Probably the time when my father tripped in the bedroom and loudly swore! (Actually I think I long knew by then…otherwise might have been terrified by the cursing Santa!). 9. Do you open a gift on Christmas Eve? Recently Nigel and I started exchanging our presents on Christmas Eve so that Christmas morning we could concentrate on the children – even so it takes them all day to open their presents as they want to stop and play with each gift as they open it. 10. How do you decorate your Christmas Tree? With all the decorations in the lower branches…. 11. Snow! Love it or Dread it? Love it – but it’s not exactly a feature of Christmas here. 14. What's the most important thing about the Holidays for you? Sounds really cheesy but I like to spend the time chosing presents and sending cards to old friends. I also like to get those circular Christmas letters from friends that I don’t otherwise hear from. 15. What is your favorite Holiday Dessert? I was going to say that there is only one – but then I remembered Trifle too. 16. What is your favorite holiday tradition? Again – all of them. Doing Christmassy things with the boys is just so much fun. Probably my absolute favourite is opening our stockings all together in bed in the morning. 17. What tops your tree? Star that Nigel and I made out of twigs and copper wire our first Christmas in this house when we realized we didn’t have a tree-top decoration. 20. Candy Canes... Yuck or Yum? Don’t think I’ve ever eaten one…might have to try this year. 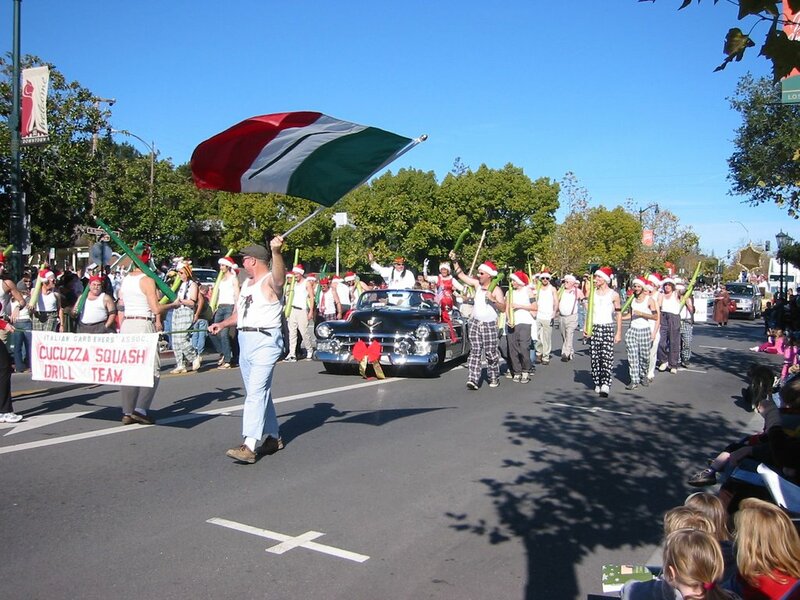 They are in the parade every year drilling with thier squashes...but I have no idea who they are - or why they are doing it. 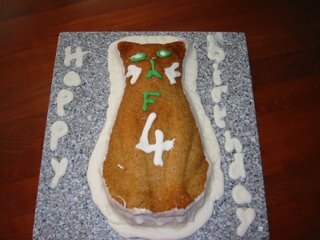 The big event of the weekend was Finlay's birthday - he reached the ripe old age of 4 on Sunday. 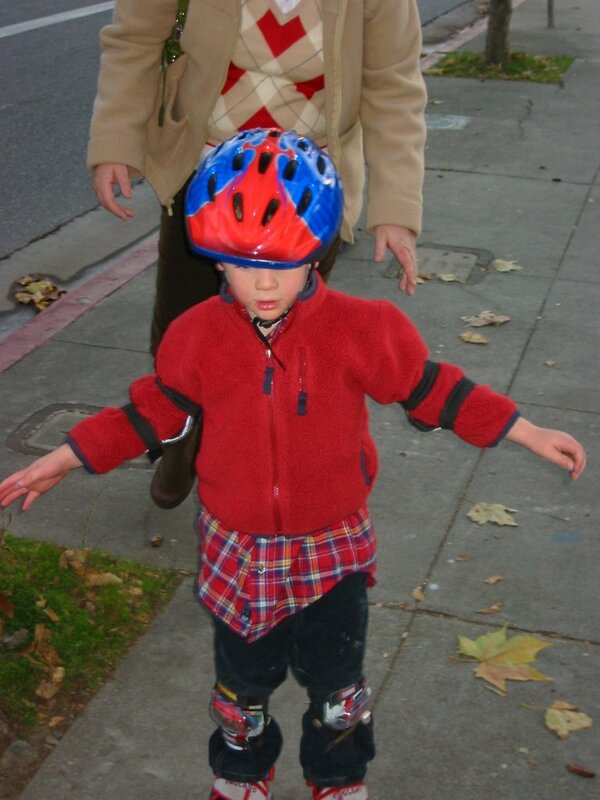 For his birthday he received roller skates. He insisted on skating all the way into town for his birthday treat which was a carriage ride around town to see all the Christmas lights. It was a lovely clear crisp evening and we had a great driver who took us on an extra detour to see some particularly well decorated houses. And of course I exploited my talents in cake decorating to make him a cake. (Its a banana cake). You see why I usually buy the birthday cakes! I finished my long socks. 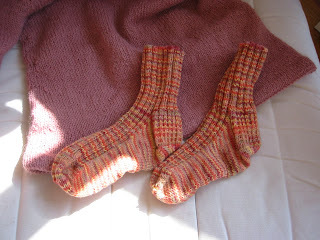 These were my first attempt at 2 at once toe-up socks and it was with mixed success. 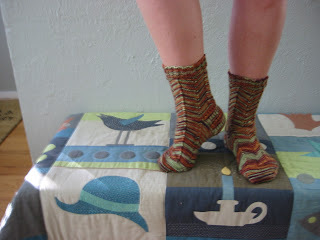 I used Kristen's pattern, which worked really well, but the short-row heels just dont have the same fit as a heel flap. While I did like getting both finished together, and the convenience that I was making up the pattern as I went along, without having to take notes, I didnt much like knitting the pair simultaneously as my wool kept getting tangled. So, here they are - knee socks. Knit in Lanna Grossa. I made several mistakes in my pattern - that is my extending them to be knee socks. I basically didnt increase enough stitches quickly enough for my calves. They fit OK - but the stitches are a little distorted, especially on the rib. Next pair I'm going back to my usual top-down pattern on dpns. By the way - the artistic shot of the socks is deliberate - knee socks are not flattering on any but the most skinny-legged of us!